Important: use European style butter, for example Irish butter. Dissolve the yeast and sugar in a little bit of milk (not cold). Add the flour and salt into a mixing bowl, make a dent and add the soft, diced butter into the dent, and add the dissolved yeast with the rest of the milk into the dent. Knead into a soft and elastic dough, knead for a minimum of 10-15 minutes. Cover the dough with a damp dish towel and let it rise in a warm area until doubled, about 1 ½ hours. Knead the dough a second time and then let it rest for another 1-2 hours. Punch the dough down, turn the dough onto a lightly floured counter, cut it in half and shape two strands to braid. Braid the strands to a long loaf and place the loaf on a baking tray lined with baking paper and let it rise for the last time for about 10-15 minutes. Brush the braided loaf with the egg wash and bake it in the preheated oven for 45-55 min at about 200ºC (390ºF). Let it cool out on a rack. Tip: replace 1dl milk with 1dl white wine. The wine gives the dough a very subtle and delicate flavor and makes the braid airy and light. Or add 4cl Kirsch water for the same result yet a different flavor. How to shape a braid? 1 cube of fresh yeast (42g) is sufficient for up to 2kg flour. Yet it is better to use less, the bread stays longer fresh. You can freeze the yeast. When using it do not defrost it but work it frozen into the milk and sugar. If yeast gets defrosted it is looses some of the activity to process. Yeast dough can get prepared the evening before. Do step 1 and then instead of letting the dough rise at room temperature, place the dough in a covered bowl in the fridge over night. In the morning continue with step 2 and 3. The dough even could get frozen for any later use. Ultimate Bread brings bread-making to the home kitchen in an exquisitely illustrated primer. 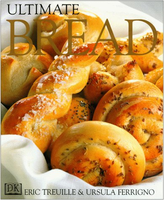 Combine DK's gorgeous visuals with two authors skilled in the art of bread baking, and you have the perfect book for anyone who has ever been afraid to try baking bread.